Jim Hagemann Snabe, Chairman of A P Moller-Maersk, was talking about the company’s experience of the cyber-attack at the World Economic Forum’s Conference at Davos earlier in the week. Describing the effects of the crisis he commented that that “we basically had to reinstall our entire infrastructure. We had to re-install 4,000 new servers, 45,000 new PCs, 2,500 new applications and that was done in a heroic effort over ten days.” Normally, he said, that would take six months to achieve. 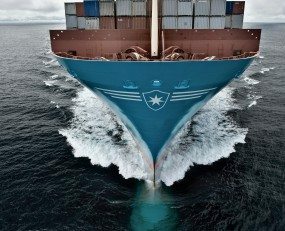 Despite the huge scale of Maersk’s operation, Mr Snabe asserted that “we overcame it through human resilience, yet we only had a 20% drop in volume. We handled the 80% of the volume manually”. Possibly qualifying this latter point, Mr Snabe admitted Maersk was “collateral damage” in a wider conflict, one which the CIA thinks was between Russia and Ukraine. It might be suggested therefore that the issue goes beyond law enforcement, rather that it is an issue of national security. Ironically Mr Snabe was sharing the discussion with the chairman of VTB Bank, a Russian bank with close links to the Kremlin.